So tell me – have you ever thought it would be nice to have a small, perfect size cake, that would serve a handful of family members or friends? Me too! Well, you are in luck, because today I have the Perfect Size Cake for you! It’s simple, easy and takes only a few ingredients to make. I don’t know about you, but often times, when I make a large cake, like a 13×9 rectangle cake, part of it, goes to waste. Now I’m not talking about the cakes I bake to take to a potluck or to celebrate a birthday, but the cakes for those everyday moments. Celebrating those little accomplishments in life are what add to creating those special family memories. Perhaps it’s the first day of school celebration, or a job promotion or maybe your child did really well on a test. All of those times call for a celebration. 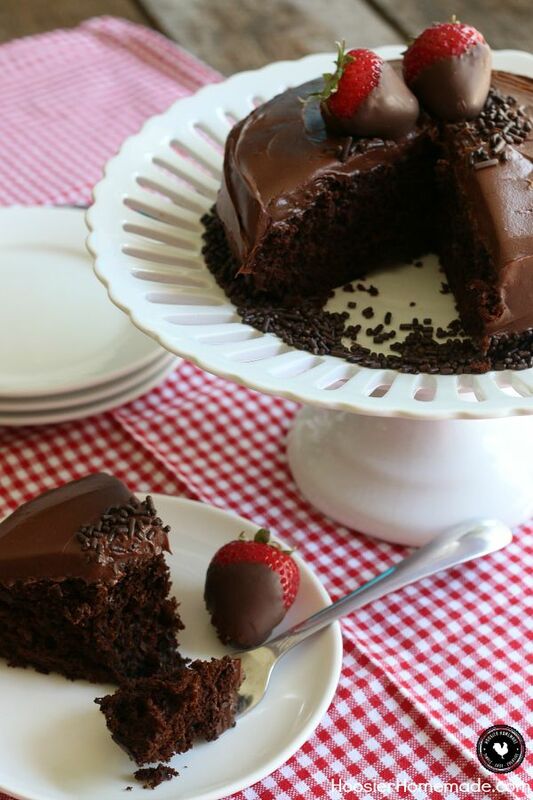 Our friends at Duncan Hines have solved this for you with their Perfect Size Cake. 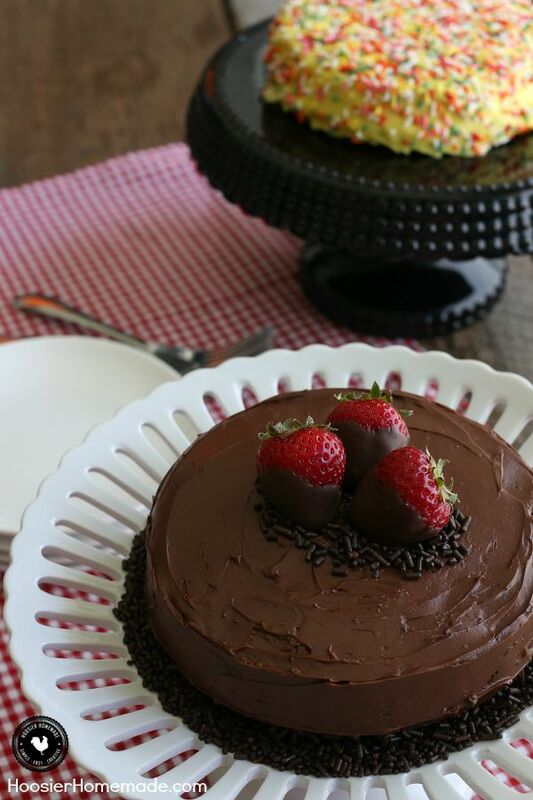 Now you can celebrate the little things in life with a perfect-sized cake for two, not ten. The box comes with a cake mix, frosting mix, and a disposable 6-inch pan. I love that the pan to bake the cake in is included. 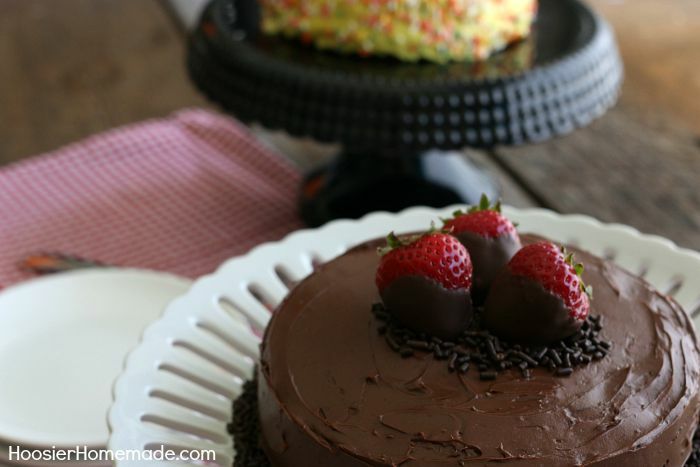 The cakes are easy to make and the kids can help too, which is always fun! Let them frost and decorate the cakes however they like. 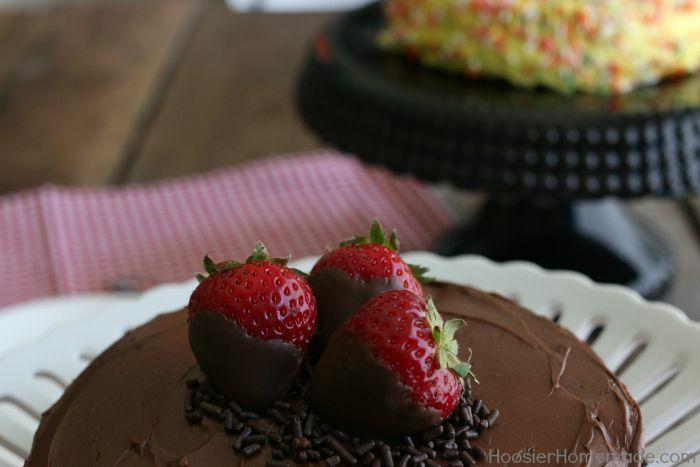 We added some chocolate dipped strawberries to the top of our Chocolate Lover’s Cake. And sprinkles to the top and sides of the Lemon Bliss Perfect Size Cake. 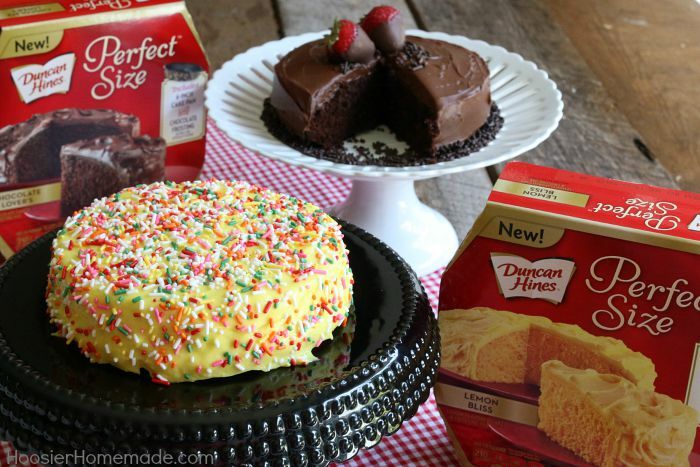 You can find the Duncan Hines Perfect Size Cake at your local grocery store in the baking aisle! Look for the uniquely shaped box. Grab a few and have fun celebrating those everyday moments! Love Duncan Hines cakes. Just got the chocolate one to try. My husband loves chocolate and now we won’t have so much left over, its why I seldom make whole cakes unless have the whole family over. This would be great for just a couple of cupcakes too. the store I shop at does not carry those cakes. Wish they did. Being a household of one, I can’t tell you how thrilled I am with Duncan Hines for this product. I’m going to the grocery story tomorrow to look for them.